UNEX Manufacturing, Inc., the trusted industry leader in providing innovative order picking solutions, announces UNEX’s VP of Sales and Marketing, Brian C. Neuwirth, has been chosen as the 2018 Outstanding Young Professional from the Material Handling Institute (MHI). Brian was chosen because of his significant contributions to the material handling industry, his passion for improvement within the industry, and his involvement in giving back to the industry by sharing knowledge and expertise at industry events and conferences. The Outstanding Young Professional is awarded to an MHI member under the age of 40 who has displayed professional accomplishments and affiliations, effective leadership skills and contributions to their company and innovation at work or in the industry. 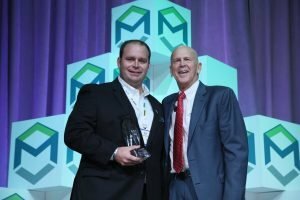 The award was given during the MHI Industry Night at the recent MODEX 2018 Conference in Atlanta. A minimum of three letters of recommendation from individuals who have been associated professionally with the nominee are required for the award nomination, along with submissions on their contributions, accomplishments and affiliations. An active participation in industry events, conferences, seminars, indicating his passion and commitment to help influence positive change in both UNEX and the industry. Bringing visions and challenges to the material handling industry forefront. Having an engaging personality with the ability to transform ideas and thoughts to implementation. Constantly innovating with product improvements and new products that fill important marketplace niches. Helping increase sales and marketing efforts with distributors, creating significant new business for those companies. Possessing vision, discipline, strong interpersonal skills and strong ethics that help in building relationships essential for long term growth. Having expert sales leadership to lead sales and marketing teams that consistently perform at very high levels. As Vice-President, Sales and Marketing at UNEX Manufacturing, Brian C. Neuwirth is responsible for building and maintaining the UNEX brand of material handling solutions. He leads a growing team of professionals that provide solid sales and profit growth, along with excellent customer service. Brian has been in the material handling industry for over 14 years and is involved in or holds leadership positions in numerous industry associations. MHI Young Professionals Network’s mission is to provide resources and programming to a diverse group of professionals looking to advance their careers in material handling, logistics and supply chain industries. Their goal is to increase industry retention, education and networking as well as to offer career support.